You would be hard pressed to find somebody who would say no to owning a candy coloured ’57 Chevy. Keith Dickson knew he was onto a winner as soon as he saw the eBay listing. “It was one of those situations where I was kind of looking for a car but kind of not. Then this thing sprung up, and it looked too good to be true. I read the fine print in the advert, and it appeared the seller wasn’t too keen on sending it overseas. I thought I would try my luck anyway and asked for a buy it now price. After some conversing and coercing I managed to make a deal. To me, it looked like a 100K car all day, every day, so I was happy to get it for a fraction of that,” said Keith. Interestingly enough, this wasn’t Keith’s first ’57. 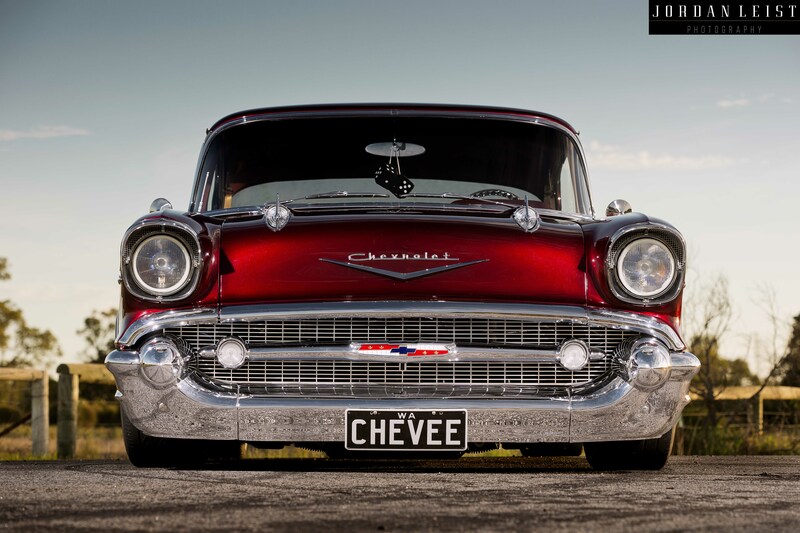 “I had a four-door version for a few years, and while that was a neat car, it just had too many doors so I sold it and hoped that one day I would get a ‘proper’ ’57.” Well, this Chevy this is on a whole other level compared to the old girl, and this is no run-of-the-mill build either, it was actually commissioned by Dub Magazine in the USA to be its feature car on their stand at the prestigious SEMA show back in 2011. Spade Kreations received the car as an empty shell and were given only 21 days to get the car to Las Vegas – crazy stuff! If you have seen some of those bad reality shows featuring car builders, then you know things don’t always go together like peaches and cream. Sadly, the ’57 was bolted together fast and rushed a little too much to make its debut. “When I got the car to Australia I could see where they dropped the ball. The time frame was just too tight, and all they really concentrated on was the cosmetics by the look of it. The wiring system on the car was atrocious – it was by far the worst part of the build and required instant attention. Don’t get me wrong, the car was still bloody good, it just needed some love,” explained Keith. The guys as Spade Kreations still spent an estimated 1,500 hours on the car transforming the bare, HOK Brandywine shell into a complete resto-mod themed machine. The Chevy runs a brand new GM Performance LS3 donk matched to an equally as-new 4L60E transmission and a 9-inch differential. Ride Tech supplied the complete suspension system that incorporates airbags all round and 4-link set-up in the rear with a panhard rod. Baer Racing Extreme, 6-piston brakes hide away behind the 20-inch TISM wheels that are shod with low-profile Pirelli rubber. After the shoot, Keith swapped over to some new billet wheels with a ‘better’ offset and did some extra work on the suspension, so the car could drive lower and nicer. Inside the car, the trimmers went to town. Anything but standard, the Chevy wears a whole heap of custom work in there. Burgundy Ultrasuede with camel coloured leather hides adorn almost every square inch of space. What real estate that is left, is filled with a heap of billet goodness and the Dakota Digital gauge set up. The diamond trim work and the custom-pressed speaker grilles are standout features. If the urge ever takes him, Keith can switch on the extensive Kicker audio system, but I reckon that would be a rare occasion. Since the car has been here, Keith has spent plenty of time on getting it in shape and finally licenced. “It took a whole heap of work, but of course it is worth it. I even scored a Top Ten placing at Motorvation earlier this year, so it was nice to get some sort of acknowledgement. The car is really appreciated whenever I take it out. People are drawn to it, no doubt about it; it has something to do with the colour.” If Keith ever gets sick of cruising the Chevy, he has a pretty-damn serious EH in the garage at home that he can beat up on. “I bought the EH around 23 years ago and kept it completely stock up until 10 or so years ago. I wanted to go fast, so I bought a VN Commodore donor car and transferred all the running gear over. The 355 stroker motor is a good bit of kit too and has pushed the car to mid 11s. The new motor and auto box should make it go even quicker.” It must be a hard choice in the Dickson household – look good cruising in the ’57 or go out bruising in the EH. What a decision!